From Munich central station, take the Regional-Express (RE) to Freilassing. From there change to the Berchtesgadener Land Bahn (BLB) and take this all the way to the Berchtesgaden train station. From there the RVO bus will bring you to the various entrances of the National Park. Take the highway A8 Munich-Salzburg. 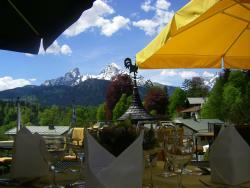 Coming from Munich, take the "Bad Reichenhall" exit, and from there take the B20 toward "Bad Reichenhall". Stay on the B20 and follow the signs to Berchtesgaden. Pure nature and fresh air! Visit the only alpine national park in Germany, Berechtesgaden, right on the border of Austria. This national park was declared a "biosphere reserve" by UNESCO in 1990. There are many different ways to explore the park. You can go for a walk through the valley, or if you are looking for something more adventurous, you won't regret accepting the challenge to hike to one of the mountaintops for unparalleled scenic views. All of the hiking trails are about 230 km in length and can also be traversed by bicycle. The central mountain massif of the Berchtesgaden Alps is the Watzmann. With a height of 2713 meters, it is the third highest mountain in Germany. Particulary interesting are the guided walking tours for adults and the special tours geared towards children. You can also enjoy a ride on one of their eco-friendly passenger boats, which operate on Berchtesgaden's pristine lake, Königssee. Visit the beautiful Berchtesgaden Royal Palace, which has been in existence since the year 1102. During a guided tour, you can admire 30 palace rooms as well as a rose garden that boasts a wonderful view of the Watzmann massif. There is also a deer museum that is especially interesting for both nature-lovers and hunters. Explore the Berchtesgaden salt mine! This popular mine gives you a modern mining experience, and with the newly designed "SalzZeitReise" (Salt Time Journey), you will be transported into the future. You can expect enthusiastic and informed guides to lead you underground. 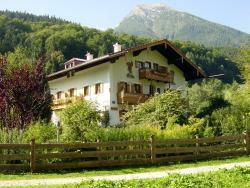 This traditional 4-star hotel is situated a 10-minute walk from the centre of Berchtesgaden and the main train station. 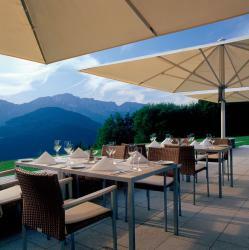 It offers free Wi-Fi, fine local cuisine and wonderful views of the Bavarian Alps.